Municipality Solutions | $79 RESchecks & Manual Js. $79 Any Plan. Any State. Your local legislature just passed the law that your building department must start requiring a REScheck energy report on every project. Great! You are already overwhelmed with project volume, tasks, and your previous job duties. How can you ever fit in the time to learn REScheck, review reports, and implement this program? The solution is simple. 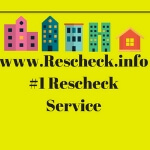 REScheck.info offers low-cost solutions for cities, counties, towns, and municipalities that offer high value in implementing REScheck reporting. For a fraction of what it cost to review your REScheck reports in house REScheck.info can compare them against your blueprints and handle 100% of the review process for you. See what 3500+ cities and jurisdictions already know. Save your building department’s budget for the important things. Let REScheck.info handle your Building Department’s entire REScheck program by contacting us today at 865-235-6277 or [email protected] We also offer free rescheck service literature to any interested building department nationwide.